DALLAS,TX — (October 1, 2015) — Mohr Partners, Inc., a global corporate real estate advisory firm, announces its representation of TR Fire Grill on its newest restaurant concept located in the Ravaudage development. TR Fire Grill was represented during the process by Corbin Bengston at Mohr Partners’ corporate office. Corbin was assisted by Rodney Langer of Investors CRE. TR Fire Grill boasts a menu full of local ingredients from farms in Central and South Florida. The restaurant serves an American bistro cuisine inspired by Chef Bob Gallagher. 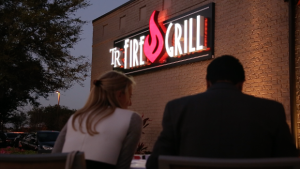 TR Fire Grill can accommodate more than 200 guests and has a large outdoor patio for visitors to enjoy.